I’m a terrible eater of sushi – the absolute worst kind. I’ve mentioned before my distaste for both raw fish and avocado, yet if those ingredients are absent, I love the bite-sized, wrapped rice rolls. When my wife had a craving for them, I was up for it and suggested we try Benkay Japanese Restaurant and Sushi Bar on India St in Portland. I assumed they had a good enough selection that I could find something to suit me. She had been there many years ago and I had never been, so it would be essentially new to both of us. Without much hesitation, she agreed that was where we should go, and we made our way over for a pre-movie meal. Arriving early for dinner, their parking lot was mostly empty and the crowd was pretty small. The restaurant was typical Japanese style with appropriate decor and a sushi bar. There was a large standard menu and a one-sheet specials menu provided. Nothing on the specials menu seemed particularly enticing to me, so I opened up the other and got down to business. I wanted some rolls and lots of them, so I looked at all the choices and then considered some apps and whatever else I thought might please my taste buds. There were some large “signature specials” which looked like they could feed an army – or me. I threw those int for consideration too. After much contemplation and passing up drinks other than water, we were finally able to come to some conclusions about what we wanted to eat. We started with Miso Soup for my wife and Calamari for me. With the appetizers in, we went crazy with the rest of our order. She ordered Tempura with vegetables only, Spicy Crunchy Tuna Maki, and Spicy Scallops Maki. I went for an order of the spicy scallop rolls too and then added kani rolls or Maine Crab Sushi, and the signature special Volcano Roll which came with fried scallop, tempura bits, tobiko, and sweet and spicy sauce. I told them to hold the tobiko though, because no matter how you label them, fish eggs/roe/tobiko/caviar is still not something I’m dying to shovel into my mouth. Food came out as it was ready, with Mrs. Portlandeater’s soup as the very first arrival. She tried it and in response to my inquiry about it’s fitness for consumption responded with “it’s hard to screw up miso soup.” That is no doubt the truth and she seemed to enjoy it sufficiently. As the soup was nearly gone, we received the tempura and squid. I tried the tempura with some of the dipping sauce with which it came just to say I did, but I am not a big fan of tempura and tend to find it on the low end of the deliciousness scale. Unfortunately, this tempura was no different, though I was impressed at the variety of vegetables included on the plate. As she worked on the tempura, I started to dig into the calamari. I prefer mine with cherry peppers aka Rhode Island style, but I certainly didn’t expect a Japanese restaurant to have such a creation. They did however have their own take on the matter which was to have some hot green peppers also fried and battered and mixed in nicely with the squid. I tried the funny, little sea creature and the peppers and found that the peppers gave the dish the boost that it needed and really added a pack of palate pleasing. The spice was only an afterthought, but the overall flavor they brought was what made the dish so good. I ate most of the sizable app and my wife took a bite or two. From there, we relaxed and awaited more morsels for munching. Soon, our rolls came to the table and I was prepared to drop those down the hatch without wasting any time. Of course, the sushi was joined by the traditional pickled ginger and wasabi and a bowl I had filled with soy sauce. 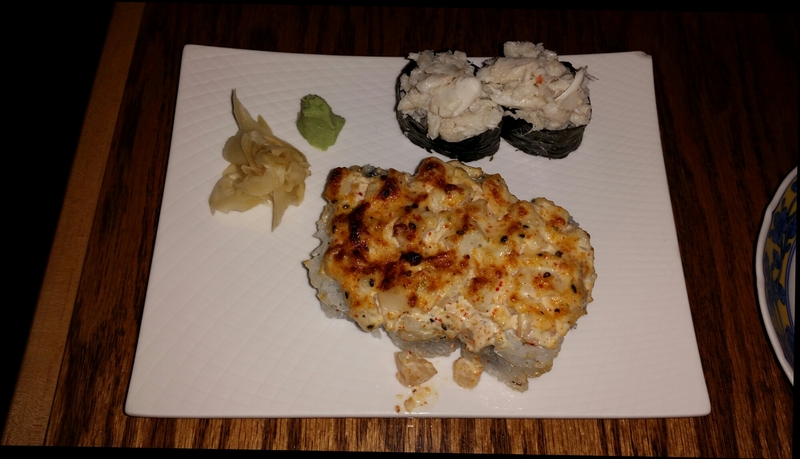 I started with the two Maine crab sushi pieces which were simply rice rolls topped with a generous portion of crab and nothing else. Adding some soy and wasabi to the mix, I ate one. It’s incredible how something so simple can be so good. The crab was incredibly fresh – among the best crab I ever had. After the first piece, I gobbled a piece of the ginger and made my way to the next. Finishing the kani made me a little sad, but then, like a shoulder to cry on, the spicy scallop rolls looked at me as if to say, “don’t worry, friend, I am here for you.” And they were, so I started working on them without prejudice. It wasn’t much of a way to treat a friend, but I made my way through them quickly and without emotion. They were excellent with the creamy, spicy sauce adding a great layer of flavor to the bivalve mollusk of which I never tire. The wifeling made her way through her sushi noting that the tuna was indeed quite spicy. I believe that meant she enjoyed it as she generally sees spicy food as a challenge that must be overcome. Just as I was eating my final piece, the last of our meal came out – my volcano roll. I was taken aback by the enormity of the task at hand. The plate was heaping full of fried goodness. I did see the pictures of it when I ordered, but how large it was didn’t really hit me until it was sitting on the table in front of me. I gave the waitress a “how am I supposed to eat all this?” She replied with the suggestion that my wife would help, but I knew that was unlikely after all we had already eaten. I did note to myself too, that without the red tobiko/lava on top, my volcano was more of just a mountain. A mountain of food seemed acceptable in place of a volcano of food, however. I was anxious to whittle down my heaping pile of Japanese joy. I tried a few pieces. Because of the tangy sauce and scallops, I didn’t have the aversion to the tempura bits as I did with straight-up tempura. And though the crunchy, fried food was somewhat heavy after having eaten all I had to that point, it was good enough to continue. With several bites gone, something interesting happened though. Like cleaning out the house of a hoarder and discovering two baby grand pianos, as I got toward the bottom of the plate, I found eight avocado rolls. I don’t know what I was expecting from a dish called “volcano roll” but I obviously didn’t look at the picture on the menu closely and the description didn’t specify actual rolls in the item. With my newly discovered sushi, I had to perform some surgery. I took each one and squeezed the avo right out of it onto my small plate. Leaving only a plain rice wrap remaining, I took each one, added soy and wasabi, chomped it down, and followed it up with the ginger. I repeated that process eight times. When all was said and done, I had eaten about 90% of the food on the plate and I felt like a whale…a very full whale. My wife had barely a single bite of the dish, but I did my best to finish what I could and not drive myself into a massive food coma. The final total was 75 bucks before tax and tip. That provided us with a huge amount of food with no drinks. If I had a do-over of my first visit, I’d stick to what I ate, but probably request cucumber rolls instead of avocado on my volcano. I might try a drink too as those were reasonably priced and looked wicked, supa good! That notwithstanding, I was happy with everything I ordered and Benkay had several items that I didn’t have to alter at all to suit my insanely picky sushi tastes. I will definitely try other items next time as they have lots of other options I would enjoy. If you’re a true sushi connoisseur and not some fly-by-night sushi summoner like me, I think you’ll like Benkay. They’re definitely in the pack with the other good, local sushi stores in terms of menu selection, food quality, and atmosphere. This entry was posted in Portland, ME food on November 26, 2015 by peterpeterportlandeater.